TTL podcast 1. Getting to CT in 30 minutes. 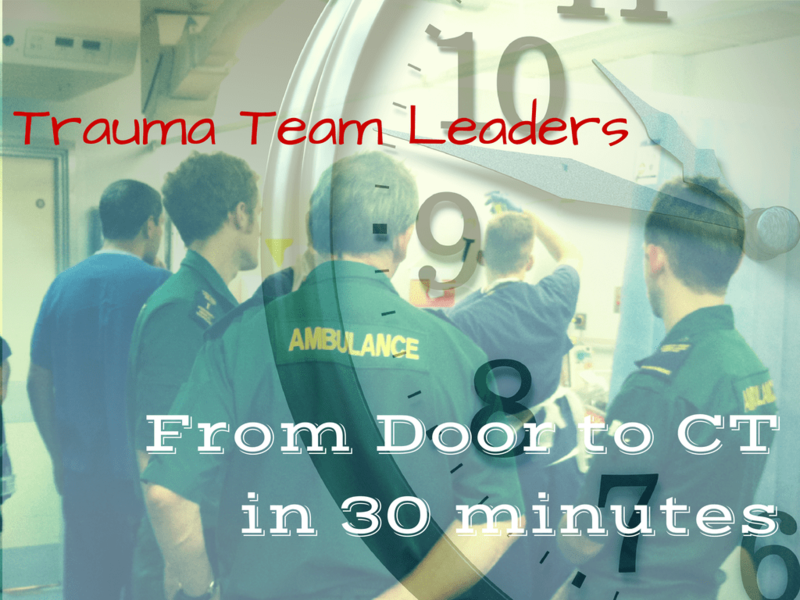 This week we have released a podcast on trauma team leadership that focuses on the management of trauma patients in the ED, and in particular a focus on getting patients from the door to CT within 30 mins. 1. Over 90% of patients with ISS>15 will be seen by a consultant within 15 minutes of arrival. 2. Trauma patients will have a CT scan report within 1 hour of presentation, but this has now changed in many areas to being on the CT scanner within 30 minutes of arrival. The 30 minute target is worthy of discussion in itself and we are working on a podcast around this for future release. In the meantime please listen and feedback. We’d love to hear your thoughts. Great discussion guys. Amazing that radiologists do the ultrasound in the resus bay. In 20 years in Australian ED’s I’ve never seen a radiologist in a resus bay apart from as a patient! And IV paracetamol? In a public ED? Has the NHS won the lottery?! Disclosure/conflict declaration: I run the Emergency Trauma Management Course in Australia (www.etmcourse.com), and I’m openly and publicly anti-“ATLS dogma”. I think your tips are great for experienced TTL’s to mull over, or for those centres where you can take a potentially unstable patient to CT with an experienced team, but I’ll be the devil’s advocate on several points. I don’t think teaching registrars to ditch auscultation is great advice (as you mention the best resus rooms are quiet, and auscultating a potential pneumothorax is actually a useful skill to learn for the non-trauma bay patient). What if the ultrasound isn’t working? What if you’re working somewhere where they don’t have one? What if it’s broken, switches off, or you forgot to turn it on? It takes 10 seconds to auscultate a chest, and reminds you to also palpate for clavicle and rib fractures/flail/concealed posterior haemorrhage/subcutaneous emphysema/anterior neck injuries etc, and in my experience is never the cause of slowing disposition from resus. In my jaded opinion, clinical examination skills are on the wane in junior doctors, and encouraging a “hands-off” approach to critical patients should be avoided. Investigations like chest x-rays and ultrasound can have equivocal results in trauma, and having the experience and skills to detect a clinical sign that may add to the clinical picture and alter your management is really important. Please don’t stop auscultating chests. The same goes for chest (and pelvic) x-rays. Detecting a pneumothorax on ultrasound takes a fair amount of skill, and sometimes time, and your view can be impaired by things like subcutaneous oedema or tissue damage/haematoma from stab wounds (as I found with a recent stabbing case). Supine chest x-rays in trauma have their flaws, but in my MTC, from the time the patient hits the bed, to the time I’m seeing a digital chest x-ray on a computer screen 2 metres from the bed is usually under a minute (and a pelvic x-ray 1-2 minutes after that). Again, never the cause for slowed disposition. Frequently a source of life-threat rapid-detection and a source of management changing information. Don’t stop doing chest x-rays. Chest x-ray picks many things that ultrasound misses like ruptured diaphragm, flail segments (that may not be overtly obvious clinically, eg in the obese patient), major traumatic aortic injury, pulmonary contusions, shoulder girdle fractures, impaled foreign bodies, all of which I want to know well before the half hour mark or the trip to CT, and some of which a patient will deteriorate from on the CT table if they go with the condition undiagnosed. Remember you may leave the trauma bay at the 30 minute mark, but even with the scanner in the next room, it can take another 15-20 minutes before you’re seeing any CT images, by the time you move the patient onto the scanner, fix up the monitor leads that fell off, administer more morphine (as you’ve moved his un-splinted fractured leg…! ), the radiographer draws up and hooks up the contrast etc etc. You then need to add in the 5-10 minutes (or often more) it takes to get the patient back to resus and implement management for the newly diagnosed problems. I for one don’t want to be waiting 45-60 minutes after the patient arrives to see what’s in their chest, and start managing it or mobilising resources that may take a while to arrive (e.g. the thoracics team). In short – don’t ditch the chest x-ray. It won’t slow you down (unless you’re still developing them on film in a dark room, in which case why are you receiving major trauma patients?! ), and may add a hell of a lot to your assessment. This is not “ATLS dogma” (as I clearly don’t believe in that! ), just common sense. Use the ultrasound as well as, not instead of the chest x-ray. Not doing a pelvic x-ray? How will you know whether to put the binder on? As you say – not by “springing” it! If it’s grossly (radiologically and haemodynamically) unstable I want that patient going straight to angio/theatre, and absolutely not going to CT. Don’t stop doing pelvic x-rays! If they take half an hour to get, you shouldn’t have that patient at your ED. Also, please open all vacuum splints and bandages on all injured limbs prior to CT. I’ve seen horrific injuries, including major dislocations, partial amputations and exsanguinating haemorrhage that was not obvious with the bandage/splint in situ, missed by failure to expose limbs. Bleeding out on a CT table is no fun for anyone. Of course don’t do an artistic full-leg POP before CT, but why leave the patient’s ankle dislocated, or expose them to the multitude of risks of concealed haemorrhage? Traction splints are also quick to apply (Donway, Hare, CT-6/CT-EMS). And you may want to CT that fracture, or do a limb CT-angiogram while you’re in CT, and avoid a 2nd trip later. Interesting take on the “militaristic” style of team leadership. The vast majority of us have no experience of what this means, and the word simply sends shivers down my spine as I envisage a more heirachical, less team oriented resus room, with orders being barked by a commander, insubordinates being told to drop and do 20 pushups, and errors addressed by court martial, and it contrasts with your excellent points about collaboration and communication. I’m assuming what you mean is a more cohesive, standardised approach, with clear roles, clear task allocation, and a clear team leader. Whilst this label may appeal to those who like very structured, ordered approaches to things, or who’ve had positive military experiences, I’d caution that you’ll lose a lot of the audience by saying “we should be more like the military”. I’m also not sure how this label flies with the 50% of our workforce that is female, as it seems to be favoured by male, current or ex-military and current jumpsuit-wearing, helicopter-jumping retrievalists/emergency physicians. On the ETM course we team leader skills (as per Cliff), as well as team member skills, including role allocation, closed loop communication (with tasks allocated to individuals by name, not “to the room”), a shared mental model (frequent summaries of the A/B/C’s to the group) and no more than 3 next steps in the forward plan, which I think is similar to what you’re describing, without labelling the “style”. Good points about calling everyone by first names, regardless of rank, and having obvious name badges or (as a minimum) large, clear role labels/stickers. Some places just use the big role label stickers but get people to write their name on it in permanent marker which is great, as badges are often concealed under gowns. Lateral c-spine – no value – don’t do it. Ketamine is a great analgesic, (but can distress some patients with hallucinations and feelings of loss of control. Pick your ketamine customer wisely). 1) If the pre-notification implies need for urgent CT – attach the patient directly to the transport monitor on arrival. It often takes the nurses at least 5 minutes to untangle leads, get the transport monitor hooked up/on the bed/ready to go. 2) Delay non-essential, time consuming tasks like: central IV access, arterial lines, indwelling catheters (NB bladders should not be decompressed by an IDC prior to abdo CT in suspected pelvic, lower abdo or bladder injury). These can all be done in theatre, ICU or back in resus after CT.
4) Have your transport drugs in a single, labelled box in your resus room, so you can just grab the “drug box” and not be sending the nurses off to collect and draw up individual drugs. 5) If the pre-notification suggests a pelvic injury – put the binder on the bed before the patient arrives – you can then lay them directly on it. 6) Kick the Radiologist out of resus, get credentialled, and learn to do the whole E-FAST yourself! I’m all for less “faffing around” and expediting disposition from the trauma resus bay, and am glad that people are at last talking about ways to improve it. Hi Andy, many thanks for the listen and comments. It’s great to hear from you and we love a bit of banter and embrace our Devil’s advocates, but let’s go through some of those comments and just clarify a few things. It’s important to remember that the podcast is focusing on those patients who are heading for pan-CT as a major trauma patient. We know that they are going to get definitive imaging within 30 mins. The podcast is based around what is an incredibly challenging target. See point 7 but it’s 30 mins from arrival to the images being produced in the CT room. Not leaving for CT. So within 30 mins we are required to… get patient into resus – handover/get onto the system – primary survey – imaging – ABC interventions – package for transport – transfer to radiology – transfer to table – CT set up – press button on CT – image recorded. It means that in order to chase this you have to really question the value of everything. We also need to challenge the legitimacy of the target and I’d be interested to hear more on what you think of it. 1. Auscultation? Don’t ditch it, but don’t rely on it. You are quite right that good teams are quiet, but patients aren’t always quiet! I’ve seen loads of injuries missed on auscultation and it’s neither sensitive nor specific. Let’s not confuse auscultation with examination though. I find other aspects of the chest exam very helpful indeed. So don’t stop listening, but don’t think that you’re going to get great information that is not available through other means. 2. Chest USS is interesting. There is evidence that it is better than CXR at detecting important pathology. Check out the USS page at resus.me http://resus.me/prehospital-ultrasound/ If I can’t USS because there is too much surgical emphysema then that’s not very difficult as I’m going to put a drain in without imaging. If I’m not going to do a chest CT then sure I’ll get a CXR, but that’s not the focus of this podcast. Iain states in the podcast that the EM reg listens to the chest so we’ve not abandoned it! He questions whether auscultation can be definitive and I think that’s fair. It’s rarely definitive and may distract. Of the injuries that you say you want to find from the CXR I would challenge you that all of those can be missed on a CXR, but they will be found on a CT. The difference in time between CT and CXR is going to be about 10 minutes so I challenge whether that 10 mins is essential for the injuries you describe. What interventions would you deliver within those 10 minutes that you could not do without either the need to confirm on CT and/or put a chest tube in on the basis of clinical/USS findings. We thought this would be the most challenging aspect of the podcast as we are wedded to the trauma CXR, and whilst we have not entirely abandoned it in practice we do think that it’s time to think carefully about it’s value in making a difference to patient outcome. 3. Remember that we are up against the clock. CXRs can be done if they are not going to delay, but as in many UK centres the (digital) films often have to go back to radiology to be processed we have found that we can be in CT before the results are back. 4. Pelvic films are also well known to miss pathology. If we suspect pelvic injury on clinical history or findings then we put a binder on and go to CT. Increasingly patients may come to the ED with binders on in some areas of the country. I don’t think you should wait until you have a proven pelvic injury before putting the binder on. In the UK we have small numbers of patients requiring transfer direct to IR/OR and in those patients we would get a pelvic film. If you spot a pelvic fracture then you are going to get a CT (unless wildly unstable) so you run the risk of double dosing them in radiation terms. As we have described the difference in timings between resus room imaging and CT imaging is about 10-15 minutes and I’m unsure how often we need a life saving intervention within that very small time window. 5. We do talk about radiologists doing FAST scans, but state that we prefer to do it ourselves (which is normal practice). ED USS is not yet ubiquitous in the UK for EM docs and then it can be helpful for them to be in the resus room to help with any questionable findings. We also do the chest USS as I’ve found the radiologists unhappy to do this. So basically, if it’s Iain or me then we do it on our own, but others may find the support helpful. As we say in the podcast when I’ve asked radiologists to do a FAST scan many struggle with the ‘fast’ bit and go off into other areas that I’m not immediately interested in. So I agree, we do the E-FAST (but not everyone does in UK yet). The major advantage to having the radiologists involved in the resus room is to plan imaging and potential interventional radiology very early in the process. Early imaging is essential in trauma care and I do value their input into the resus team. You talk about the radiology team keeping a scanner free. We agree. When the trauma pager goes off the radiologist and radiographer attending means that they are involved in the patient care and that they can then clearly articulate the needs of the patient back to the department. Having a radiologist listen to the initial patient handover and to clearly understand what injuries are suspected can only be a good thing. 6. The militaristic style could be misconstrued. We clearly talk about being quiet, cooperative, calm organised and efficient. Military efficiency rather than burly sergeant majors (have you met us??). If the image conjures up some burly RSM with a stick and tache then that analogy isn’t working for you. Rather we are talking about being clear about roles, responsibilities, communication, commitment and teamwork. UK trauma teams have been influenced by the experiences in Bastion and so that is where our militaristic model comes from. Perhaps that does not translate to an international audience as well as it might. So perhaps it’s not what you think, but if not there is no harm in restating it what it does mean. 7. Just to be really clear about timings. The clock starts when the patient arrives. The clock stops when you get your first images recorded on the CT scanner. In your example you talk about 30 mins being more like 45, but that’s the point. It’s not. It’s 30 mins from arrival to image and when you realise that it becomes so clear that this is an amazingly challenging target. 8. All your comments about leadership on the ETM we completely agree with and try to emulate. We’ll be covering these and others in future casts. o	Binder on bed – always for any MOI suggesting possibility. o	Disagree about radiologist. Sure we do the scans ourselves, but don’t dismiss one of the most important members of the team. Learn to love your radiologists. They are really, really, really helpful and might just save your patient’s life. So, as Devil’s advocate thanks. I’m not sure we were quite as draconian as you suggest, but it’s good to relisten and debate. I’m still most interested in what you guys think about a 30 min target. Great podcast, thank you Iain and Simon. I would do things differently! We have a CT co-located in the ED at our MTC which might influence some of the differences. First of all the pre-alert has said abdominal and pelvic pain so the pelvic binder is going to be laid on the ED trolley ready for when the ambulance team move him across on the scoop. I hate the ‘jiggle’ technique of pelvic splint application as I don’t believe it facilitates adequate positioning and frequently gathers under the patient creating a pressure sore risk. If the clinical assessment is no pelvic binder indicated we can lift the whole scoop and remove the binder, before we split the scoop. Primary survey – I am really interested in the respiratory rate and the level of respiratory distress this patient has as to whether I will insert a chest drain early in management. I will also review after a decent amount of Morphine, IV Paracetamol and possibly analgesic doses of Ketamine, as his breathing problem might be predominantly due to pain from rib fractures rather than the lung injury. If his breathing does improve, I am not going to do any primary survey imaging (I know, controversial hey). No CXR, pelvic x-ray or ultrasound. I don’t believe it is going to change my immediate management pre-CT that I haven’t already considered based on my clinical assessment and observations. I can look at the scout view as it comes through on the CT and then get one of my team to prep for a chest drain if indicated whilst the rest of the scan continues. That will save a massive amount of time pre-CT and ensure a sterile insertion technique. If he has significant respiratory compromise after analgesia then yes, I would image the chest. In our department, more likely to be a CXR. I would have a peep at the leg to check there is no missed open fracture (frequently seen) and examine distal neuro-vasc sensation. Did you mention Tranexamic acid for this patient? Why are you giving crystalloid with P120 and BP150/90? I wouldn’t give him any fluid before CT…… until he became hypotensive and then I would give blood as my first fluid. ‘STOP the lunatic’ springing the pelvis is entirely appropriate in my opinion! Can we see a copy of the trauma transfer checklist please Iain? Yep – we put the binder on the trauma mattress ready for the patient. If for some reason it’s not there then it can be placed either by a jiggle or the method you describe. I think you have quite a mature prehospital team in Coventry so I would hope that a high proportion of your patients come in with them on. TXA – yes if we think blood is likely to be needed we give it. I agree with your thoughts about CT imaging. It seems to me that the shorter the time between arrival and definitive imaging the less value there is in imaging that we know to be ineffective (e.g. CXR). I guess what you decide to do will depend upon what is available in your patch. Everyone feels for tracheal deviation – but it means nothing. Fluids. If we think they are going to need blood they get blood. No argument there. There are risks with O -ve blood (which is what we would have to use if immediate requirement) so we need a judgement on when to press that trigger. That’s a really important question and probably a subject of a future post/podcast. I’d be really interested in your views on what makes you say ‘OK, let’s go O neg’ as it is arguably quite a tricky decision, and of course that’s really a route into MHP protocols too. Great podcast. This is the kind of ‘patient processing’ we should all be aiming for – cutting out the unnecessary until after the CT. If we can achieve this 30 min target in 50% of cases then we’re probably doing very well. 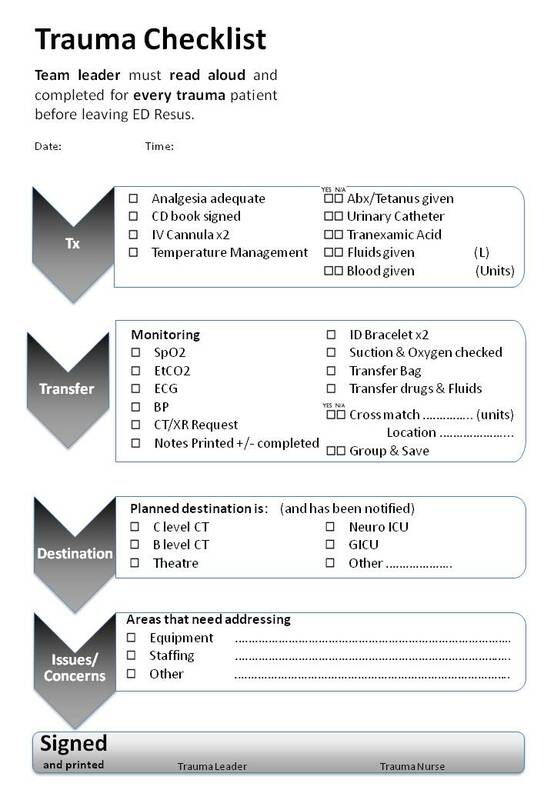 Are you able to post the pre-transfer checklist referred to in the podcast? It’s something we’re working on at the moment. Thanks very much for listening and taking the time to comment – all great thoughts. I’ve added our UHS Transfer Checklist in above. I’d be very interested to know if you (or others) use similar and find it useful. I remember we talked about TARN and the 30 min target briefly at the EMS gathering, I think the 30 min target is a bit false. There are many interventions that may be more important than CT (which is diagnostics and does nothing to fix the patient) that may necessitate a delayed move to CT or indeed obviate the need for CT at all. It is most certainly a challenging target. I’m really interested to hear whether people feel it is a safe target. In education we say that assessment drives learning, and in a similar way I find that in the UK/NHS I find that targets drive behaviour. It does mean that we need the right targets. A colleague when faced with the 30 min dilemma said ‘the only patients we will achieve that on are the ones who don’t need it’. Now, I’m not quite as nihilistic as that, but there is some truth in it. Patients who require no ABC interventions are arguably the easiest to get to scan quickly. Do you have a target in Ireland? I think TARN report on the 30 min CT time so if you’re in it’s probably available to you. We have neither a target nor a system in Ireland so we don’t need to worry too much about time to CT ;-). We’ve just started TARN so I haven’t seen any data yet. Absolutely delighted that our podcast has encouraged so much discussion on both the blog and Twitter. It’s always great to hear how other people are doing things, and be reminded that trauma systems are at varying stages of evolution in different areas of the world. 1, Fluids – It seems that many people advocate a “blood or nothing” approach and that to give anything other than the red stuff is wrong. I think we are talking about treatment for two different diseases – yes, if the patient is bleeding and haemodynamically compromised then give them blood. But what if the bleeding has been stopped (or is not significant enough to need the “tap turning off”)? – they will still in all likelihood have some element of volume depletion, due to a prolonged prehosptal phase or the increased metabolic requirements due to injury, or be about to be “NBM” for a period of time awaiting surgery. I don’t think these patients should be denied “some” iv crystalloid during these phases for maintenance of a normal criculating volume. Blood for resuscitation, iv crystalloid for volume maintance would seem a reasonable approach. I’m sure this is what people mean, but I would hate for a trauma patient to be denied some iv fluid bacause their TTL thought that it should be “blood or nothing”. 2, Pelvic binders – completely agree that major trauma patients should have these on and our prehospital service are pretty good at making sure this happens. Always worth checking the position though. Aim for the position of the skirt of a teenager heading out on a Saturday night, rather than that of her grandmother going to church. 3, Analgesia – I’m a great fan of asking the anaethetist on the team to help with this. Ensures buy in from them with a non intubated patient and they have all the drugs to hand. I still see a reluctance to give “low dose/non-dissociative doses” of ketamine and try to encourage this when possible, especially if there are going to be procedures such as chest drains, etc. 4, As for targets these are a subject of an upcoming podcast, but I wold probably sum them up as a “necessary evil”. Thanks again to all for listening. The feedback has been great and we can only hope you are learning from and enjoying them as much listening to them as we are recording them. Great podcast , really interesting listening. i)	Absolutely agree that performing a resus CXR should not be done if it going to delay the patient’s transfer to CT. If the trauma team works together effectively this should not happen. As you know Simon, our major trauma team has a plain-film radiographer as part of the trauma team and, although a CXR may only considered useful in a minority of the patients we see, when they are required I believe they can be of great value. As one of the previous commenters has mentioned previously, with our new DR mobiles the image is available within seconds of being obtained (and interpreting the image gives the radiologist in attendance something to do whilst the rest of the team is assessing the patient!). My only thought with this is if a patient appears well enough to be transferred but has a suspicion of a pneumo/haemothorax that may need a chest drain but not immediately, would a CXR demonstrating that the patient does have a pneumo/haemothroax compel a clinical to insert a drain prior to transfer to CT (and possibly miss the 30 min target)? Pelvis x-rays in resus are rubbish though. The relatively high radiation dose and low sensitivity of them doesn’t justify them being done and if you believe someone has a pelvic injury they should be having a CT anyway. Ditto lateral c-spines. ii)	In departments that don’t have a truly co-located CT to resus ,communication is all important and having someone from Radiology (probably a radiographer rather than a radiologist) in attendance linking together CT scanner availability and transfer of the patient from resus is key to hitting 30 mins and ensuring the transfer is as safe and short as possible. iii)	The 30 minute target. Do patients have better outcomes if they are scanned in 29 rather than 31 minutes? No. But quicker definitive imaging undoubtedly does benefit most patients and unless there is a target to motivate trauma teams to perform definitive imaging quicker this probably won’t happen. I think there needs to be better reporting on TARN of this data rather than just a blunt “what percentage of patients were scanned in under 30m minutes” as this would better demonstrate how MTCs are doing in this respect. I agree with all of that Jon. I think it’s REALLY important to consider radiology as the radiology team and not just the radiologist. In terms of compulsion to put a drain in then that in itself is a really interesting question @traumagasdoc is currently running a twitter debate on whether all trauma PNX need a drain – even if they go to theatre and it’s a good question. The 30 min target is in itself really interesting. It’s a very blunt tool and reports in a rather strange way. It only includes those patients who end up with an ISS of over 15 and not those in whom we thought an ISS of over 15 was likely. In Virchester we get a lot of penetrating torso trauma that needs a CT, but the conversion rate into those with an ISS >15 is small. We get lots of people through within 30 mins, but they don’t appear in the figures. On the other hand an elderly patient who fell 4 days ago, walked in, GCS 15 with a headache who then has a subdural on CT is considered a FAIL if not scanned within 30 mins. There is increasing evidence that the pattern of injury seen between different trauma centres in the UK is different. Central London is different to the rural SW. Different patterns of injury present different problems in achieving this and many other targets but there is no adjustment for it. So, yes I agree and thanks for the input. This is a fantastic subject. I’d love to see how the data turns out. Although the actual value to a Pan-Scan on most patients is questionable, and the value of a pan-scan in under 30 minutes is even more questionable, it certainly seems to be a reasonable goal. I can tell that it is making you question the dogma of quite a few of your typical trauma steps. You guys do a great job is discussing the stuff that most everyone agrees could be removed from the urgent trauma resus before urgent pan-scan: c-spine x-rays, “springing” the pelvis, plaster splinting, and combing that patient’s hair. They also question the utility of some other “historical” portions of the primary and secondary exam that may have limited value: auscultation the chest, tracheal palpation, the log roll, routine rectal exams, and the chest and pelvic x-ray. I totally support questioning the value these protocolized, insensitive, nonspecific, and time-wasting tests and procedures on sick blunt trauma patients who will be through the CT scanner in less than 30 minutes. Especially: don’t do bad tests (tests that take essential time and have poor sensitivity and specificity) if you’re about to do a good test in the next 30 minutes. thanks for a thought-provoking podcast. I’m at the end of my CT3 EM year at the Royal London in Whitechapel, so have started to gain a real appreciation of team leading in the last 12 months. Having listened to the pod I was just about to start making a list of my thoughts listening to the podcast for later discussion etc. I found the idea of the resus room as a 2nd stop prior to CT (the roadside as the 1st) as particularly useful. One question really struck me that I wanted to ask you which I don’t think you discussed – it relates to people as finite resources and competing demands. – “release” members as soon as their supposed primary role is no longer required – for example, “releasing” the anaesthetist when the team leader is happy with the primary survey and there is no acute airway issue. 1. If you effectively do CT as part of a primary survey, without doing the minor wound care/plastering/hair-combing before you go to CT, then a life-threatening injury is found on CT and the patient goes straight to theatre (as often happens with us where we don’t have a colocated CT yet), how do you ensure that the appropriate care of the secondary injuries happens. Eg if the patient goes to theatre for control of their liver laceration, how do you ensure that the wound care and the ankle fracture plastering are done right? 2. Re the orthopaedic registrar reaching for the pelvis…. how do you manage Dr A N Other who arrives and assumes that they are trauma team leader? This may be less of an issue for you two who are male and established consultants (!). However, how do I manage someone (let’s say for argument a consultant anaesthetist) who rocks in just after the briefing and instructs the ED nurse over my head to “run a litre of saline in now”? I’m familiar with graded assertiveness but I’m not sure how appropriate that is as a team leader? Getting to the discussion a little late but great podcast and great discussion. I find your 30 minute target…interesting…and not all the useful. I think there is a better metric out there in regards to trauma team efficiency and quality- the “no procedure” 10 minute limit. As background- as a medical student I did a trauma rotation at a true “knife and gun club” that saw lots of penetrating trauma. It had a robust trauma surgery department and fellowship and was a highly respected institution in the area. On the wall was a clock that started at the time the patient arrived. Each case was reviewed the next day at rounds and you really had to explain yourself if the patient was in the trauma bay for more than 10 minutes (before going to CT) and didn’t get a procedure. They had to crank through those lesser injured patients quickly because the next GSW or knife wound was just around the corner. To me- being able to efficiently (but safely) get a patient out of the bay in under 10 minutes speaks to how well your team works and the effectiveness of your processes. This expediency can come at a price of patient safety if you don’t take a step back and make sure everything was done properly before leaving the trauma bay but it works wonders for ED patient flow and trauma team readiness. Trauma is a resource intensive field that inevitably takes away from the care of other patients in the ED. We need to be mindful of the other patients in the ED when we drop everything to care for (often) a single patient. As far as I am concerned- if you need anything more in the trauma bay than IV access and analgesia and then you are entitled to as long as it takes to fix that problem. Don’t rush a semi-emergent chest tube (without tension physiology) just to make a target- do the full sterile prep and do it right so the patient doesn’t end up with a raging infection. You shouldn’t linger either but if that is what the patient needs, that is what they need. I’d be curious to know how much of your practice are these patients who don’t need procedures in the trauma bay. As a perspective from the US- in my own practice I would say it’s about 60-70% or higher. Medicolegal concerns mean that we have many patients who are taken to us as a priority one trauma alert based solely on mechanism that have little or no injuries. (Don’t get me stated on trying to argue with the trauma service about not pan-CTing everyone…). Would you say that a higher percentage of your patients need procedures in the trauma bay? Do you have issues with getting patients out of the bay quickly who don’t need procedures? CT being the “donut of death”- I agree and disagree- it all depends on your institution and the way it is designed. I think of this as dogma from the days when CT scanners were up a floor and at the other end of the hospital. Today, my institution has one in the Emergency Department (for better or worse when it comes to the non-trauma patients). If your CT scanner is on the way to the OR and you can continue resuscitation in the scanner room with blood products then you should get that CT if it will help you make decisions (open the chest or open the abdomen? Go to OR or IR?). I have heard this called “meta-stability”- the thought process goes something like this- “yeah they are still sick but I think they can make it through a CT scan in the ED to help me make a crucial management decision” I think we have beaten it into trainee’s heads that you can never take a sick patient to the CT scanner which is hogwash. As Simon pointed out, you need it to make the diagnosis a lot of times. What we have learned from the days of the CT scanner being less available is to be prepared- have your airway equipment and other resus equipment (including blood if needed or TPA for that giant PE) in the room ready to go at a moment’s notice. Bravo to your radiologists- I love my radiologists (especially the collaborative ones who work with you) but they are perfectly ok with sitting in their room reading films and CTs. They have no interest in coming into the trauma bay and I don’t want them to because it slows down reads for my other patients. I have heard stories about the early days of bedside ultrasound when radiology residents would come to do the FAST scans on trauma patients. That was until they couldn’t get down to the trauma bay quickly enough and EM started doing them. A FAST scan has to be fast!- I couldn’t agree more- once you are ready to package the patient for CT, the usefulness of your FAST scan in a hemodynamically stable patient just vanished. You have now lost your opportunity to gain any useful information from that scan so if you are going to do it- do it fast! Simon mentioned about not wearing gloves as the trauma team leader- while I still have on full PPE (mask down) as team leader, I do something else- I cross my arms and fold them tightly across my chest to prevent me from doing anything. I call it the “Mary Katerine Gallagher” from Saturday Night Live (http://www.hulu.com/watch/4121 skip to 1:17). I violated this once- combative and altered attempted hanging came in and ripped out his prehospital IV. I had the IO already out so I stepped up to his tibia, popped the IO in, and we continued with the resus and RSI. I think as team leader you can step in for a task but it should be a short and well-defined task and not something useless like central access or the dreaded unnecessary urinary catheter. Regarding becoming more “militaristic”- by this I think you mean having established hierarchies? As a military officer there is a built in hierarchy to what we do but, for better or worse, medical providers insulated from the “Sir, Yes, Sir!” rigid hierarchy that is seen with the real soldiers. You could probably put a military trauma team and a civilian trauma team side by side and you probably wouldn’t be able to tell the differences except for a few more “Sirs” and “Ma’am” being thrown around. There are still hierarchies that exist in regards to level of training and that is more prevalent than anything to do with actual rank. I think the most valuable lessons we can take from the military are those that are learned the hard way on the battlefield and those that are taught to us by books such as On Combat. Finally- pelvic “springing”- I have pretty much threatened bodily harm on someone who tired to do a repeat pelvis exam (I couldn’t stop the first one…) in a patient who was clearly hemorrhaging into their pelvis. I agree with Anthony Scalea from Shock Trauma- “every time you rock that pelvis, the patient just lost another unit of blood” Just don’t do it! Really enjoying your podcasts – well done! The checklist a great idea! I hope you don’t mind me making a number of observations. – CD booked signed is a not related to the patient and while I can see its practical importance, maybe it should be part of a “tidying up and restocking the used resus bay” checklist? – some of the questions could be more focused, for example rather than is EtCO2 monitored it could be “is EtCO2 targeting 4-5 kPa?”, and rather than “oxygen checked” could be “Is BVM available?” and “Is second full CD cylinder available”. In-theatre WHO checklists are a good example of how broader questions like “do you have any concerns” are invariably lead to vague answers. Finally, I wonder if a final point could be “Next-of-kin updated?” or something like that? Good stuff – keep it coming!